Get stoned and laugh your cares away in this playful improv comedy workshop. No previous theater or improv experience required! Play group improv comedy games with us in a fun, supportive, women only environment and maybe even make a new friend! Lead by Sarah JK Shoemaker, Associate Artistic Director at Curious Comedy Theater. Snack and a beverage provided. 21+ BYOC. Date: Sunday, March 19 Time: 2-4pm Early Bird – through March 15: $25 General Admission – after March 15: $35 Limited space available. Early reservation is recommended. 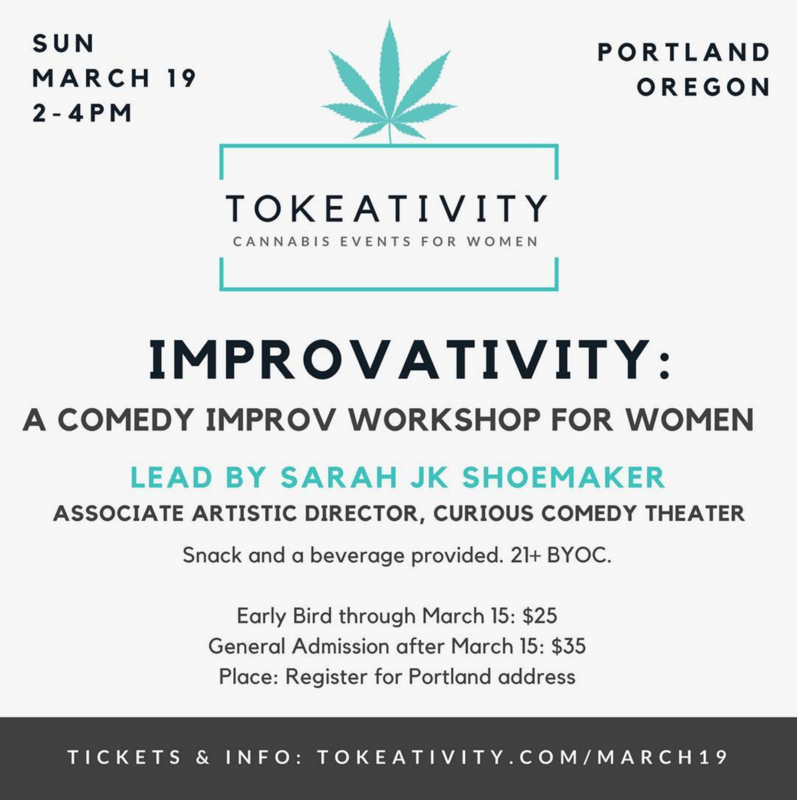 RESERVE YOUR SPOT HERE: https://tokeativitymarch19improv.eventbrite.com ABOUT SARAH Sarah JK Shoemaker is the Associate Artistic Director at Curious Comedy Theater. Before moving to Portland, Sarah lived in San Francisco where she was an instructor and company member at Leela Theatre as well as Un-Scripted Theatre. She was a founding member of the all female ensemble Peach Pit and guested with Kari and Company. In 2015, Sarah guested with The Hills are Alive with the Sound of Improv at BATS. In May 2014, she graduated with her Masters of Fine Arts in acting from the California Institute of the Arts. For the past five years she has been part of the improv troupe, Tall Grande Venti now YaS Improv. In March 2014, Tall Grande Venti won the National College Improv Tournament. Since then they have performed in the Guest Fest in Seattle, Alaska State Improv Festival, the Miami Improv Festival, Improvaganza in Hawaii, San Francisco Improv Festival, Sketch Fest in San Francisco, Las Vegas Improv Festival, Out of Bounds in Texas, the Seattle Festival of Improv, guested at the Curious Comedy Theater in Portland, OR as well as Jester'Z Improv in Phoenix, AZ and have performed in the Edinburgh Fringe Festival. Sarah JK Shoemaker has been teaching for 10 years at theater and dance companies around the United States including California Institute of the Arts, Leela Theatre, Un-Scripted, TBA Theatre, Kenai Performers, Anchorage Classical Ballet Academy, All American Dance as well as workshops at various festivals including The Festival de Liege, Last Frontier Theater Conference, and the New Works Festival. She continually volunteers in various schools to teach improv in Emotion Disturbance rooms throughout California and now in the Portland area. ABOUT CURIOUS COMEDY THEATER Curious Comedy Theater is the only 501(c)3 in Portland dedicated to the art of comedy. Our mission is to improve the lives of kids, adults, and seniors through the art of the comedy. We produce affordable local comedy programming, partner with local schools in our Play On Words Program using Improv to improve literacy skills and produce Festivals to support underrepresented voices in comedy.